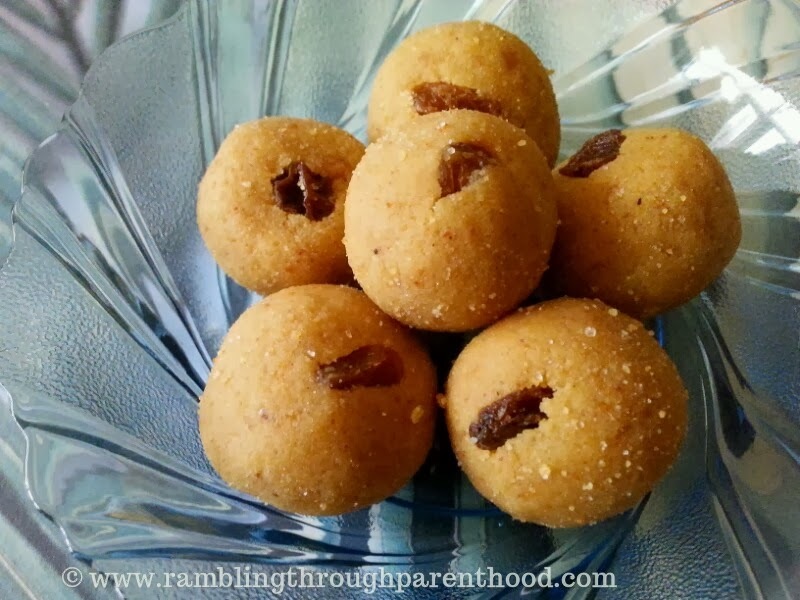 Diwali would not be complete without a lot of home-made sweet and savoury delicacies. This is the first Diwali since J was born, or for that matter the first Diwali ever, when I have wholeheartedly assumed cooking responsibilities. I am after all a very new convert to domestic goddess-ness. So I have been slaving over the kitchen stove these last couple of days, following my Aai's (mother's) instructions (thank goodness for hands-free and speaker phones), trying my very best to produce some edible goodies. Some experiments were glorious fails, some were fairly successful, and some more were salvaged by timely intervention by Aai on the end of the phone. I did manage to make some rather delectable besan laddoos (M and J will vouch for these, as will the rapidly dwindling numbers in the box). These are essentially delicious little balls made up of gram flour or besan. Start by melting the ghee on a medium flame in a wide pan. Add the gram flour to the warm, melted ghee to roast it. Keep stirring the flour around the pan quite frequently to prevent it sticking and burning. Add the milk, a little at a time, to the mixture. Don't stop stirring. Keep roasting the besan till it changes colour to a lovely golden brown, and once the smell of raw besan disappears. Remove the pan from the heat and allow the mixture to cool completely before you do anything with it. This is really important to ensure an optimum outcome. Once the mixture has cooled down, add the sugar and the cardamom powder. Give it a good stir so that it is all mixed uniformly. Now scoop a little mixture into the palm of your hand and roll it into a little ball. Use both palms to make it go really smooth. Tuck a little sultana into the ball, and voila! Your besan laddoo is all ready to be eaten. P.S. Do not attempt this recipe if you are on a weight reduction programme. Alternatively, alter the ghee-to-milk ratio if you really, really must. Cut back on the ghee and bump up the milk. Not too much though, or you will end up sacrificing the taste. P.S. 2 If you think the mixture is too dry and you can't roll it into a ball, try adding a few spoonfuls of melted ghee or milk. Just enough to moisten it so that it becomes easy to roll. These look yum! I'll definitely be trying these. These sound yummy. We aren't fans of sultanas though, could you maybe substitute for something else or leave without? You could try raisins or half an almond or cashewnut if you like those. Or leave them out completely.